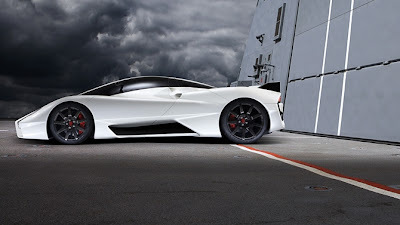 After our initial post about the new SSC Ultimate Aero II concept car, TopGear has revealed new images and information. They are continuing the “fastest car in the world” battle between the Bugatti and several other concepts, but the pricing and specs are now here. It will come powered by a four-cam 6.8-liter twin-turbo engine, capable of revving to 9,000 rpm to produce a whopping 1,350 bhp. The Aero II blowers are an SSC design, and it’s already accomplishing these numbers on Shelby’s dyno. The final car will be constructed of all carbon except for aluminum crash rails on the front and back. Its transmission is still the same SSC unit with a triple-disc carbon clutch, and the option of sequential paddle shifting.